This is one curry that may surprise you at how easy it is to prepare the spice mix for such a tasty meal with so few simple pantry ingredients. Roast and grind your own spices if you have the time and equipment to do so, but I mostly use ground spices at home for ease. The added bonus of a curry is that it will improve in flavour as it sits so prepare it on the weekend for a busy weeknight meal. 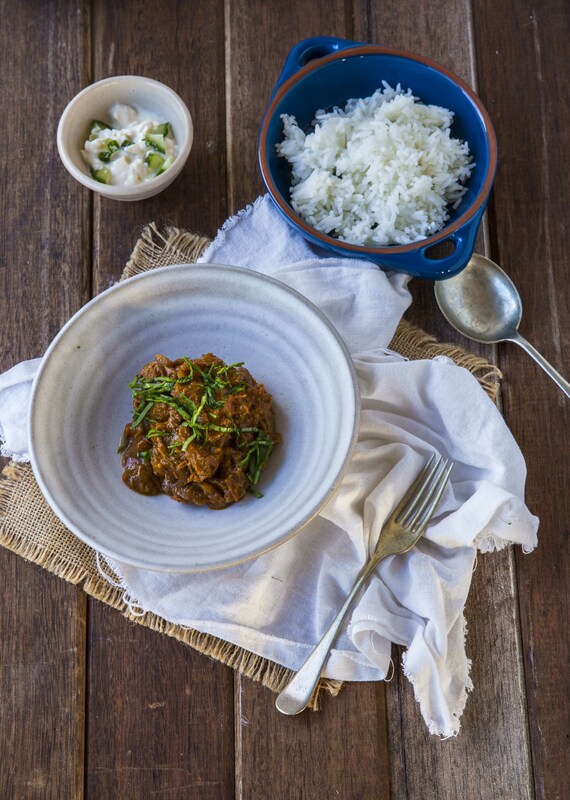 For these reasons this curry, with some rice and steamed greens, has been on the menu most weeks during winter. I make it extra hot so I serve the kids something I have pre prepared, frozen and defrosted and reheated. dice the meat into about a 1.5 cm dice. Brown the meat on all sides in batches in a hot pan on the stove top. In a heavy based oven proof sauce pan saute the diced onion and crushed garlic in the butter for a few minutes until soft add the spices and cook for a few minutes add all the other ingredients and braise covered in a low 160 C oven for 1-2 hrs until tender. Or put all ingredients in the slow cooker on high for 4-6 hours.